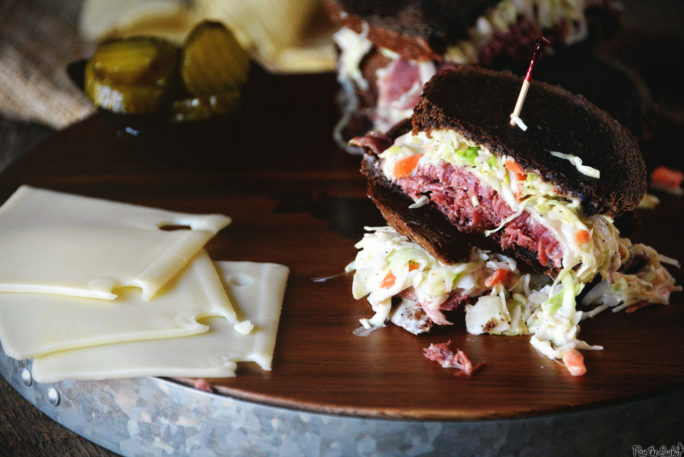 This Corned Beef Sandwich shouldn’t be complicated. It is a smash and grab of what you have laying around, piled high to create the best damn bite you can shove in your mouth all at once. So Good. Sandwiches shouldn’t be complicated. They should be a smash and grab of what you have laying around piled high to create the best damn bite you can shove in your mouth all at once. They should require napkins and be messy. Make your eyes roll back and you sigh in joy. They should make your lover worry. Then, they should make that lover sit back in proud satisfaction. Proud that you didn’t try to delicately slice up your masterpiece and eat it with a knife and fork. Proud that you are brave enough to go all in with bold combination of flavors. So look across the table, raise an eyebrow, take a bite. And see how your lover reacts. Either they get it, or it just wasn’t meant to be. 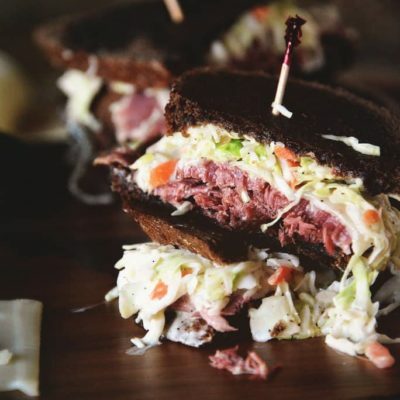 If you’ve tried my Corned Beef Sandwich recipe, or any other recipe on GirlCarnivore.com please don’t forget to rate the recipe and let me know where you found it in the comments below. I get inspired by your feedback and comments! You can also FOLLOW ME on Instagram @girlcarnivore as well as on Twitter and Facebook. Over the top sandwiches and burgers are totally my jive. Check out these creations! You can’t stop at one bite. Preheat skillet or griddle over medium-high heat. Smear one side of each slice of bread with the Russian dressing. Pile generous portions of coleslaw over the bottoms. Season with salt and pepper if desired. top with even more generous portions of sliced corned beef and a slice of cheese. Top with remaining bread halves. Melt the butter in the skillet and place the sandwiches in. Press each to get a good brown on the bottom of the sandwich and cook 3 to 4 minutes before flipping and finishing off the other side to a nice toasted golden brown, about 3 to 4 minutes longer. The cheese should be melted and things should be starting to get messy. There are parts of a cow that just aren’t easy to eat. Brisket is tough, and generally chewy. But, let it sit in a brine for a while, then slow cook it all day and suddenly it is tender as can be, and full of flavor. 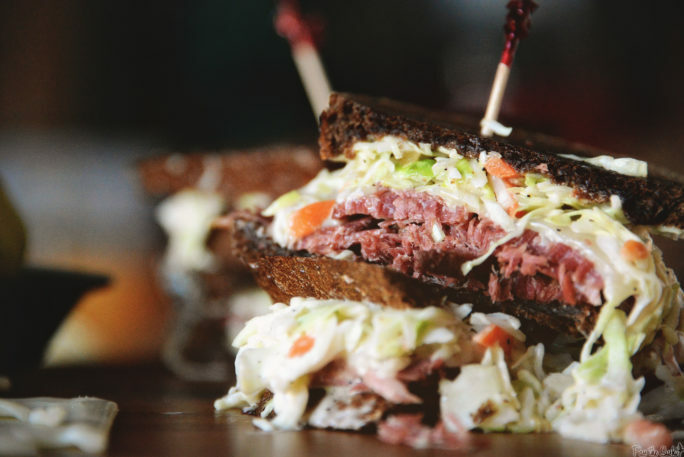 This is why we make corned beef. And the end product is well worth the wait. 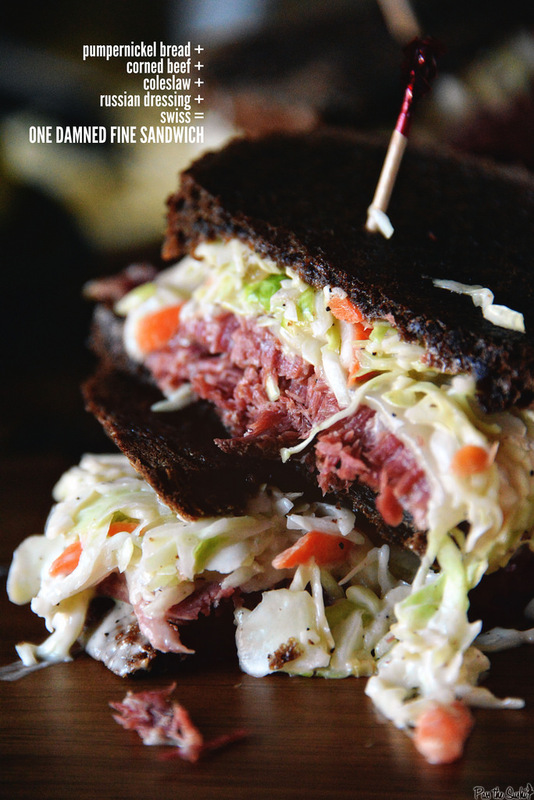 Your recipe is OK but I prefer the more traditional rye bread for my corned beef sandwich. Also use yellow mustard and Fontina cheese. Sorry just not a big fan of pumpernickel bread.